Sleep soundly and peacefully with our deep relaxation techniques for sleep. This powerful sleep audio shows you how to fall asleep using natural sleep aids. Meditation for sleep is a proven way to help with chronic sleep problems, and gently teaches you how to sleep better. *Please note the Vocal Only version does not contain binaural tones. Do you regularly suffer from sleeping problems, or sometimes have difficulty sleeping? If the answer is yes, let our soothing sleep audio help you. Sleep deprivation is no joke, most of us experience it at some time or other, usually when we are going through some form of stress – it’s as if we forget how to fall asleep. Chronic insomnia is an increasingly common health issue. Its effect on mental health and well-being should never be underestimated. Good, recuperative sleep is nature’s way of repairing and is essential for all-round health. Sleep meditation trains the body and mind how to fall asleep naturally. This meditation for sleep uses progressive relaxation techniques, hypnotic suggestion and state of the art music brainwave entrainment, (binaural tones to induce the delta ‘sleep state’) to help you get a good, recuperative night’s sleep. Dr Christopher Lloyd Clarke, the composer of the beautifully soothing music, has applied the scientific principles of psychoacoustics and music psychology to promote well-being and relaxation. Please note that brainwave entrainment music requires the use of headphones, so that each ear receives a specific frequency. You can listen through regular speakers but the binaural tones will not be as effective. 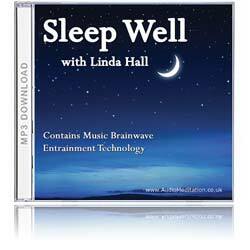 Sleep Well is also available with or without the binaural tones. The use headphones is recommended with versions containing the binaural tones. To find out about Brainwave Entrainment Technology click here. "Listening to Linda's clear and gentle guidance encouraging me to feel my support, follow my breathing and rest in myself simply allows sleep to come to me. A gift." - Carrie Tuke, Body-Mind-Movement Therapist, Helen Bamber Foundation. "Sleep Well signals to the busy part of my brain that it's time to stop doing, and prepare myself for sleep. I cannot tell you what a difference a good night's rest makes and how this has been helped by the CD. 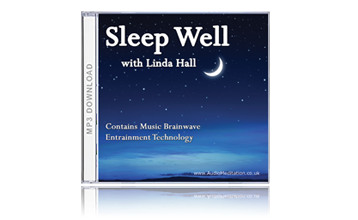 Linda's gentle and soothing voice is comforting as well as reassuring, meaning I can completely relax and allow myself to go with it. I would recommend it unreservedly." - Charlotte Atkinson, Lincolnshire. "I had a night recently when I couldn't fall asleep. I'd worked too late into the evening and just couldn't settle. I listened to Sleep Well and fell fast asleep, feeling very peaceful and delightfully soothed. I was aware of feeling like I was surrounded in velvet! I'm delighted by how good it was and will be very happy to recommend it to my clients who have trouble sleeping." - Amanda Falkson, Psychotherapist, London.